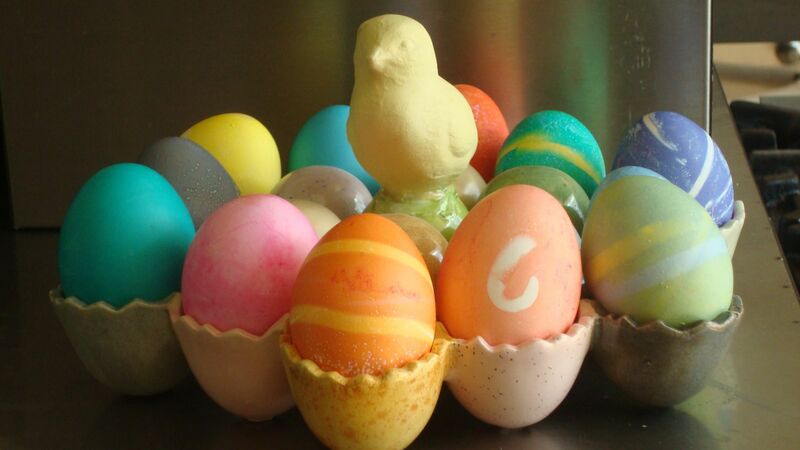 Dyeing eggs for Easter with my daughters is a fun tradition, and one that only gets better with the passing years as they have long ago passed my ability to execute such craft-type projects. This year the girls were inspired to use rubber bands and tape and, as you can see from the above picture, they turned out lovely. Part of our new tradition (these change some every year) is to dye the eggs the day before Easter and to eat them on Easter. This is when I remember how much I love hard-boiled eggs. I always think that we’ll need to make egg salad to use them up, but all of us Krauses like hard-boiled eggs. We sit around the table with little ramekins of salt and a pepper grinder and plow through them. I know that eggs are a great symbol for the themes of Easter Sunday, and while I heard a great message about hope this morning, I sure do love eating those eggs. I failed to mention in the text the delight of eating a hard-boiled egg that was decorated by your daughters. I hope you had a wonderful Easter. Molly, I need help. It’s Alison from Lenexa. How are you able to peel a boiled egg and not rip the egg white to shreds? I’ve heard that an older egg peels much easier. I’m at wits end on getting a good looking peeled, boiled egg.